The president of the Indian Business Alliance, Moscow sees bright investment prospects in the energy, pharmaceuticals and tourism industries. Indian investors, who have only recently begun to see Russia as an important destination, tend to shy away from the Siberian regions of the country. The most important economic forum, which brings together the brave investors who are ready to conquer the vast expanses of Siberia, is held in Krasnoyarsk annually. Investors from India are not frequent visitors to this forum. The sole representative this year was the president of the Moscow-based Indian Business Alliance, Sammy Kotwani, who intends to prepare recommendations for Indian investors on Siberia’s development. “Siberia is like a totally different country with different possibilities,” says Kotwani. It makes economic sense for Siberian regions to expand cooperation with Asian countries. It is cheaper to transport goods from here to the markets of much closer countries such as Japan, China, South Korea and others in the Pacific Rim countries rather than distant European countries. “The new governor (of Krasnoyarsk) has realized that it is pointless to focus on Europe or the West and is now focusing more on the East. Investments can also come into the country and operate competitively in Siberia, moreover, without any politics,” Kotwani adds. Kotwani has been in Russia since the Soviet era. He started out as a simple tailor. He arrived in Moscow back in 1990 and began to make suits for diplomats. His business grew together with the country. 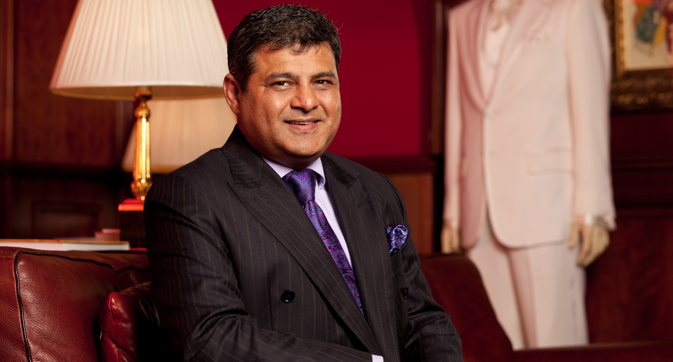 After the start of market reforms, Russia had an influx of foreigners, and Kotwani began to make suits for them too. In 1998, when the country was in a crisis and defaulted on its debt, foreigners left. The Indian tailor then started working with Russians. Kotwani now heads the Russian–Indian Business Council and has a prestigious office that is a stone's throw away from the Kremlin. He promotes Indian culture in Russia, arranging magnificent shows on traditional Indian festivals like Holi, gathering not only representatives of the Indian diaspora, but also Russians. For those who want to take a closer look at Siberia, he believes that it’s important to remember the fact that unlike the European part of Russia, the area is a much weaker consumer market. Its population is quite small, although there are large cities. Kotwani believes that projects in areas such as energy, pharmaceuticals and tourism can be lucrative. However, the fuel and energy sector is still heavily regulated by the Russian authorities. As for pharmaceuticals, Siberia provides truly immense opportunities. “We plan to tell our Indian colleagues about the opportunities in Siberia… to provide them with organizational help, if they decide to enter into the projects in this territory. We must inform and convince them that we should not only go to Moscow, but that Russia has other places where people live differently, and there, you can work in more relaxed manner than you can in the capital,” Kotwani says. He recalls that in Siberia there is a state-run program that supports those who create a pharmaceutical cluster. There are also unique herbs growing there that can be used as the base for medicinal compounds. The project is in its initial stage, and there is still time to join in. Indian companies need to explore the opportunities offered in the manufacture of medicinal products in the territory, Kotwani adds. However, it should be borne in mind that under the Russian legislation, a foreign investor can own only 49 percent of the enterprise located on Russian territory. However, one should be bolder when making a choice. In Russia, the ‘Pharma 2020’ program is in operation. This suggests that by 2020, all medicines sold in Russia, must be manufactured in its territory. “Indian pharmaceutical companies have only 5 years remaining to consolidate their position in Russia. We advise you to open your production here; otherwise the Russian market will be lost. We recommend looking not only at the European part, but also at Siberia,” Kotwani says. The entrepreneur points out to quite a warm business climate in Russia for the Indians. Moscow and New Delhi have had long-standing friendly relations since the days of socialism, and the Russians' attitude towards the Indians is generally quite warm. After the collapse of the USSR, the young Russian Federation even maintained a preferential import duty for Indian goods for some time. Now there are no such benefits, but the Customs Union (which includes Russia) and New Delhi have developed a special research group that will further develop the establishment of a free trade zone. Only two countries – Vietnam and New Zealand have progressed further than India on this issue. “From my experience I can say that nothing happens without risk. We must be brave enough to take risks, because business margins are higher in Russia anyway. You need to go to the Russian regions, and explore investment opportunities there better. This applies primarily to small and medium-sized businesses,” Kotwani adds. Overall Kotwani recommends looking at Russia as a friendly country when it comes to business. “There is some kind of a phobia. We do not understand each other’s potential, and both of the countries are at fault. Russian companies have a misconception that it is difficult to do business in India, that there is corruption everywhere, a lot of bureaucracy. Russia also has that, and it needs to be eliminated, but we have a window of opportunity,” he says, adding that it is necessary to seek the creation of a trade a union between Russia and India without any political context.